Clear and exact specs are critical to the success of a project. It prevents confusion, compares “apples to apples” if you are shopping around and eliminates any concern that you might not be getting what you asked for, or what you THINK you asked for. Here at AA Global we will work with you as partners/consultants to help you navigate the sometimes confusing field of all the different options, but really that online form we have is really, really good. The paper stock you select will have a major impact on the colors and look/feel of your printed piece - as will the amount of ink laid down on it. Heavy ink coverage on gloss paper or an incorrect amount of ink coverage on others (more than 240 Total Ink Coverage for uncoated light-weight text stocks, or more than 280-300 for heavier stocks for example) will impact your print in many ways. Too much ink may leave your document more sensitive to scuffing and scratching if it is not coated or laminated. It may cause smudging and other artifacts if the ink does not dry sufficiently between colors or after printing and may require more drying time. AA Global will work with you to help prevent over-inking and provide you with the information you need to ensure appropriate ink coverage for the paper you’ve selected. Because of the inaccuracies in the finishing processes, images need to extend (or“bleed”) beyond the borders of your page. Not having bleed may result in the page being trimmed leaving a sliver of white (no ink) paper around your document. Even a fraction os a m”m will be noticeable and will make that document look sloppy. Bleed prevents this from happening. Tip: Always use a template that gives you 1/8 inch (3 mm) bleed all around the page and make sure that all images and other graphic elements extend to the edge of that bleed area. Pulling an image off the internet may be tempting to do but think of this: Hi-end presses print at a resolution of 300 DPI (on average). Internet images are around 72 DPI (typical screen image resolution). Printing that image on a hi-end press will result in pixelization and generally a poor looking document. Due to the dynamic nature of high-end printing presses, there is always the risk that one or more of the 4 process colors (Cyan, Magenta, Yellow and Black) will not align with the others, resulting in a mis-registration or shift. 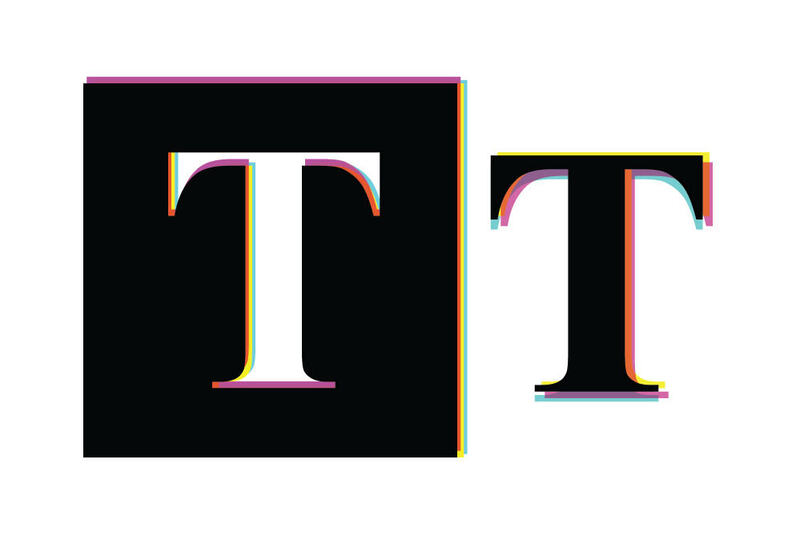 This causes text made up of multiple colors to look unsharp, often with a “rainbow effect”. This can be mitigated by using Black-ink-only (or single-color) text. Just as in the above, there is always the risk of one or more of the 4 process colors (Cyan, Magenta, Yellow and Black) not aligning with the others, resulting in a mis-registration or shift. This causes knockout text to look unsharp, often with a “rainbow effect” and especially smaller type to fill in and be hard to read. This can be mitigated by limiting knockout text to a minimum of 6 point type. Personal Space - in print as in life. Give your text (and the message it conveys) room to “breathe”. Too close to the edges, or too close to ANY other graphic element creates a look and feel or something harried, scraped together without thought or consideration for the reader, the intended recipient of said message. This can be mitigated by giving text it’s own personal space and always leaving a safety margin of at least 1/8 of an inch all around your document, free of text or graphic elements. Repurposing your document to a different binding style? Be aware that these may have different requirements and safety margins. Wire-o binding for example (a double metal wire spiral that holds the pages together) very useful for training manuals, presentations and user-guides, requires holes be drilled on the binding side and then the spiral is threaded through those holes. Not enough safety margin on that side might mean that important text will be compromised or not visible. This can be mitigated by leaving a good 10-15 m”m from the binding edge (depends on the number of pages and size of spiral). AA Global can help you plan your wire-o (or any style) booklet and make it a success.